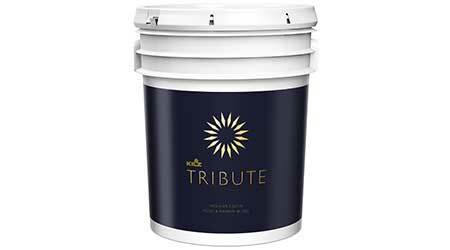 KILZ Tribute Paint is a 100 percent acrylic interior premium paint and primer in one. The low VOC formula offers exceptional stain-blocking and durability. Available in 150 colors, in matte, eggshell, satin, and semi-gloss. Unlike other traditional matte finish products, Tribute matte paint is suitable for high-traffic areas and even use on surfaces where moisture and mildew may be a problem. Dry paint film is mildew-resistant in all sheens. Available in gallons and fives. UL GREENGUARD GOLD Certified for low chemical emissions.